Long-lasting flower power will create a delightful Cottage garden effect whether in borders or pots. Create a delightful flowering border or a fabulous container display with this new hydrangea - a classic English garden favourite. Bang on trend as cut flowers or for winter displays, hyrangeas are known the world over for their colour-changing heads of gorgeous flower. 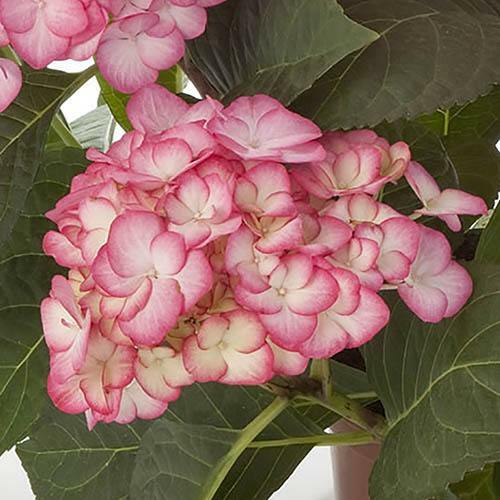 Easy to grow and a breeze to maintain, there's a varity suitable for everyone, and this fabulous new two-tone Patio Hydrangea is from the same breeders who brought us the exciting 'Glam Rock'. Perhaps this one is more subtle, but just as packed with patio flower power for sure. Each petal is white to blush pink, edged deep rose, massing together to form their iconic mophead flowers, which last really well if cut for the vase, or will smother your patio and garden all summer long if left on to enjoy on the plant Sure to be a hit with bees foraging for summer pollen too. Then as autumn passes, the leaves turn gorgeous orange yellow too. For best results, feed and water well when in leaf and active. Grow in full sun, in garden soil or in large pots.